Not long after the Sonrise Babies Home was established in 2009 by Damali Manyindo the Sonrise Community Church met for the first time started and led by Pastor Ivan Mukulu, Damali’s brother. It’s grown greatly since 2010 and is currently located adjacent to the Sonrise Babies Home in Jinja, Uganda. Just look for the big yellow tent. 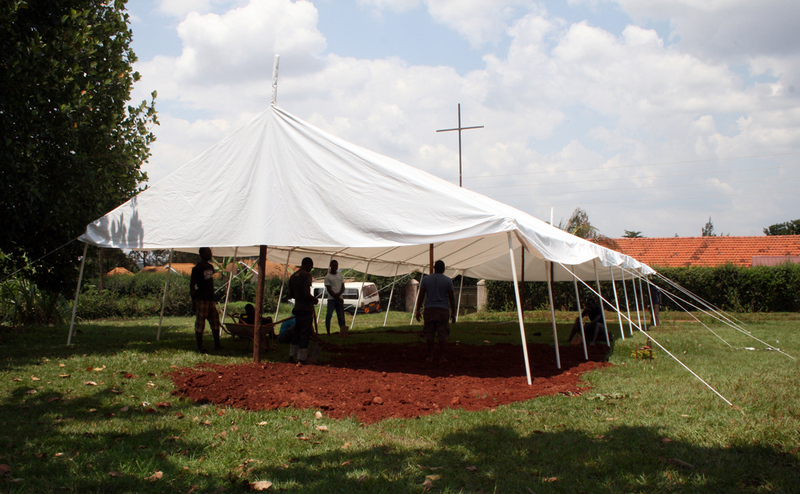 With the help of the Lord and much faith, this first congregation has established 7 other churches located in various southern Uganda provinces. There is a tremendous need to raise up biblicaly sound pastors, evangelist and youth leaders in Uganda. With the help of several of Pastor Ivan’s understudies and visiting pastors from the USA, we’ve graduated our first group of 14 pastors, July of 2018. The next class of 50 are ready to begin. Study duration is about 1 year but there are financial needs. Click on the link to the right to read our list of financial needs. Mercy Ministry, a benevolence fund used to assist people within our congregations who need help with food, medical care, other emergency needs.